Thomas was born on the 8th January 1884, the son of Thomas (Foreman in Livery yard) and Ann Whiston (née Coates) Farlam, they lived at St Anne's Stables, Buxton, Derbyshire (1901 Census RG 13/3270)). 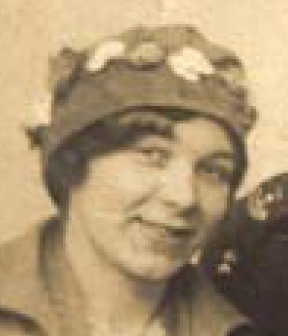 He had an older sister, Rhoda May and five younger brothers and sisters, Joseph, William, Arthur Stanley, Margaret E. and Dorothy Jane. 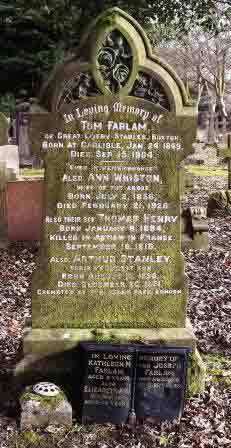 Thomas' father died on 15th September 1904 and in 1911 (Census RG 14/21243) he was employed as a "Grocer's Assistant", living with his widowed mother and family at 13 Torr Street, Buxton. 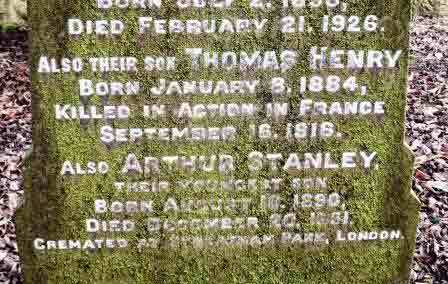 Thomas was educated at Buxton Board School and when in Buxton attended St. John's Church. home of Sophia Yeoman, Annie's mother. January 1962, at Dannholme, 132 Alumhurst Road, Bournemouth. Thomas' (known as Harry) Service Papers have not survived Second World War, neither does his Medal Index Card give much detail. 'The Buxton Advertiser' of 7th October 1916, in reporting his death, gives the date of his enlistment as February 1915, at Chesterfield (confirmed by his Service Number), and that he was posted to France on New Year's Day 1916. 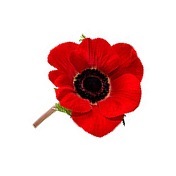 On the 19th August 1915 the 4th Battalion had been attached to 3rd Guards Brigade, Guards Division. During 1916, after Harry joined them, it took part in various battles associated with the Battle of the Somme. Led by General Sir Henry Rawlinson, 12 divisions and 49 tanks attacked the German front-line on 15th September 1916. The tanks surprised the Germans and in three days the British captured 2 kilometres of German held territory. However, a large number of the tanks broke-down and Rawlinson's army was unable to hold on to its gains. The Guards Division advanced north-east of Ginchy some 2,000 yards but ended up short of its final objectives. It would seem that it was on the second day of this offensive that Harry was killed. 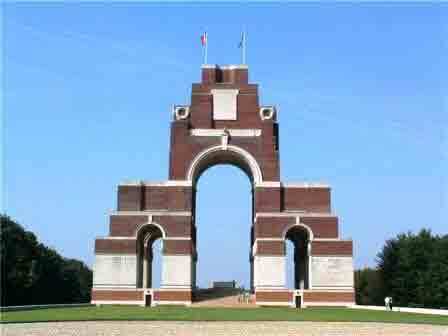 He may have been buried, but in the ensuing to-ing and fro-ing of battle his body was lost and he is now commemorated on The Thiepval Memorial to the Missing, along with most most of the 20 men of the 4th Battalion killed on the same day. The Bn moved from bivouacs near CARNOY about 9:30 p.m. on Saturday night (9th September) and moved EAST for ¾ mile when it was halted and told to wait till further orders. The 48th Brigade attack had succeeded and they had attained all their objectives including GINCHY and the Welsh Guards went forward to relieve them. The 47th Brigade attack had failed and the troops, after very heavy losses, were all back in the original lines from where they started. The Brigade on the RIGHT of the 47th Brigade had succeeded in attaining their objectives; thus the LEFT of the 167th Brigade and RIGHT of the Welsh Guards were in the air and separated by a distance of about 600 yards; the LEFT of the Welsh Guards was also in the air owing to the attack on its LEFT having also failed. At 11:45 p.m. OC 4th Bn Grenadier Guards, who had been at Brigade HQ 47th Brigade during the attack, arrived with orders for the Bn to relieve all troops of the 47th Brigade and take over their trenches. The Bn moved off, No 1 Coy leading, under a light shell fire across country, leaving GUILLEMONT immediately on its LEFT and heading direct for GINCHY. The advance was necessarily very slow and it was 3am before the leading Coys arrived in trenches and took over from the remnants of the 47th Brigade. No 1 Coy on the RIGHT got into immediate touch with the supporting troops of the 167th Brigade. No 2 Coy in the centre linked up with Nos 1 and 3 Coys. No 3 Coy had its RIGHT on No 2 and its LEFT stretching NORTH towards GINCHY. After a considerable time No 3 Coy got into touch with some very exhausted Munsters. No 4 Coy and Bn HQ established themselves in an old German trench 500 yards to the EAST of GUILLEMONT and 600 yards behind No 2 Coy. Connection to ANGLE WOOD COPSE was established by relay posts and telephone communication from there to Brigade HQ. An attempt to connect up with Coy HQ by telephone failed owing to shell fire. At 5 a.m. the 10th relief was complete though the situation as regards the enemy was very obscure. Patrols at once went out and got into touch but the thick early morning mist and general confusion in the trenches, the condition of which was indescribable, bring filled with killed, dying and wounded, rendered it impossible for OC Coys to render a clear report of the situation. Enemy shell fire at this time was accurate and heavy. The enemy Infantry in our immediate front was very active sniping and patrols from both sides continually met in NO MAN'S LAND [which varied from 80 to 200 yards] frequently not knowing whether they were friends or enemies. The situation remained the same all Sunday the 10th, heavy shell and rifle fire on both sides being continuous. On Sunday evening Captain GRAHAM and No 2 Coy 1st Bn moved up in support and No 3 Coy extended NORTH, No 4 Coy taking its place in the line. OC No 3 Coy [Captain STEWART] found the situation on the LEFT very obscure, whole trenches being obliterated while constant sniping and shell fire made any movement almost impossible. He at least got close touch with a Coy of 2nd Bn Scots Guards who had been sent up to support Welsh Guards. Some Coy of 1st Bn Grenadiers were also supporting Welsh Guards who were heavily attacked in front and rear and both flanks. On Monday the 11th shelling of our line increased and frequent barrages were put on us throughout the day. At 4:30pm Captain GRAHAM, 1st Bn Grenadier Guards, received orders to make a bombing attack across the gap which still existed between the RIGHT of the Welsh Guards and troops on my RIGHT. This took place at 1am Tuesday and was successful though Captain GRAHAM and Lieut ARMAR CORRY were both killed and the Company had heavy casualties. Lieuts LLEWELLYN and SHELLEY, both of this Coy, had previously been wounded. At 1:30 a.m. Tuesday the 12th the ? Bn Suffolk Regt arrived at Bn HQ to relieve us and by 4 a.m. all Coys were clear of trenches. Nos 2 and 4 Coys were placed at the disposal of OC Welsh Guards and sent to TRONES WOOD. Nos 1 and 3 Coys and Bn HQ to BERNAFAY WOOD, arriving at 5:30 a.m. At 9 a.m. No 3 Coy was sent forward at disposal of OC 1st Bn and was used to establish connection between units in the line. ½ No 1 Coy were ordered up as a carrying party. At 10pm the Bn was relieved by the 1st Bn Scots Guards, Nos 1 and 4 Coys and Bn HQ arrived at this Camp at 1:30 a.m. No 2 Coy arrived at 1:30 a.m. and No 3 Coy at 3:30 a.m. 2/Lieut R F TOMPSON was killed on the night 10/11th by shell fire and Captain C GOSCHEN wounded. Our casualties from 9th to 12th were 1 officer killed, 2 wounded, Other Ranks 16 killed, 75 wounded [8 still at duty] and 5 missing. 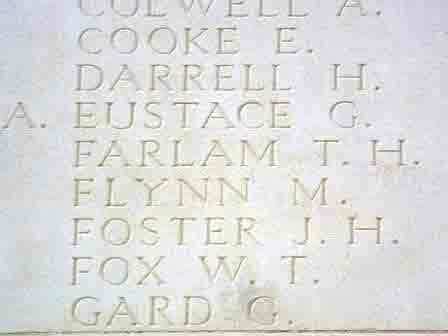 Lieut R Y T KENDALL was wounded yesterday when No 2 Coy was sent up in support of the 1st Bn. All officers and senior NCOs attended the funeral yesterday of Captain GRAHAM and Lieut CORRY 1st Bn Grenadier Guards. Brigade Conference yesterday at which the objectives and dispositions of the next commencing tomorrow morning was given. The 1st and 2nd Guards Brigades attack supported by the 3rd Guards Brigade. 6th Division is on our RIGHT and 14th Division is on our LEFT. Bn moves up to CARNOY tonight." These three named Officers killed were Lieut. Ronald Fawcett Carrier TOMPSON, buried at GUILLEMONT ROAD CEMETERY, GUILLEMONT, Capt. Alexander Cecil GRAHAM and Lieut. 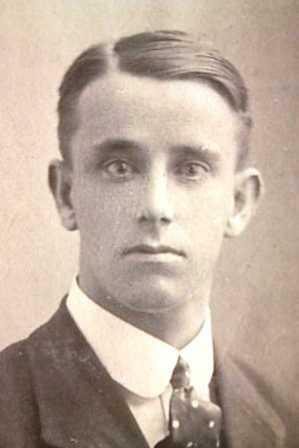 Armar Valentine LOWRY-CORRY (both 1st Battalion), both buried at CITADEL NEW MILITARY CEMETERY, FRICOURT.
" .... I am writing to tell you that your husband, Harry, has been killed: he was killed by a shell on Saturday, 16th September. He was a great favourite of all who knew him and all the platoon will miss him greatly. Assuring you of our deepest sympathy in your great bereavement."